Following on from our previous blog post detailing the top 10 social media tips, this week we focus on KUMO‘s guide to Search Engine Optimisation (SEO). SEO has taken its place as an essential part of a business’ marketing strategy. With the internet being as big a phenomenon as it is, there aren’t too many online sessions that are initiated without the assistance of search engines. As a result, ranking well in the search engine results pages (SERPs) is often vital for businesses. This is especially true for those that don’t have the instantly recognisable name that some of the big brands have established. Search engines are primarily text based machines. They crawl the web looking for text content to scan and store a cached version of a web page in their vast data centres. Images, videos and other rich media forms that humans find engaging mean nothing more than a line of code to a machine. Websites need to find text on a website / webpage to understand its purpose. The more text, the more a search engine understands. There is no specified amount of text to include on a page. As far as advice goes, you’re probably best to implement as much as possible without beginning to sound irrelevant. It’s also very important to note that you should be writing for humans first, search engines second. The keywords or phrases that you choose to place on your site can make or break your SEO campaign. If you do not include the phrase you would like to rank for, as well as latent semantic variations of that term, on the page it is highly unlikely that you will appear in the search results for it. Keyword research involves finding keywords that are actively being used in combination with keywords that you can compete with. You can use a combination of Google’s Keyword Planner and Keywords Everywhere to research and find the perfect fit for your site. Broad terms are likely to have a vast range of search and as such, a higher level of competition. Long tail keywords (very specific, multi-word terms) usually have less competition but less search. The search for these terms tends to be more actionable. Depending on the nature of your business, you may have more luck with one or the other but in most cases, a combination of the two works wonders. Every single page on a website needs to be unique. The search engines hate it when they find the same text content on more than one page. 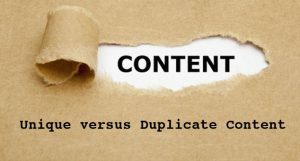 Internal or external duplicate content will cause your site to compete against itself and both versions will be devalued. Google wants to provide the user with the best possible result for the search query. Having multiple versions of content indexed confuses the search engines and they will look elsewhere, majorly harming your website’s SEO. With your pages devalued, traffic and conversions are certainly going to be impacted. You can use Copyscape and Siteliner to check for internal and external duplication. The way we use the web is changing. More searches are now carried out on mobile devices than desktop. This has led to a change in the way Google indexes the web. Google recently released a statement revealing that it is in the process of moving its processes to be a mobile first index. Historically, the desktop version of a website was viewed as your primary site. Now Google will look at the mobile version of your website as the main point of contact for the searcher. If your website provides a poor user experience and is not optimised for mobile devices, the website will be downgraded in the search results. The Title Tag (the clickable hyper link in the search results) has a direct impact on rankings. This should be no more than 482 pixels and no shorter than 200 pixels. It needs to contain the page’s primary keyword for the most effect. The Meta Description (the small chunk of text under the link in the search results) has no impact on rankings but needs to be written to entice the user to click on your page. Think of it as your own piece of real estate in the search results. Write for the user, not for the search engines. The Meta Description should be no more than 928 pixels and no less than 400 pixels. 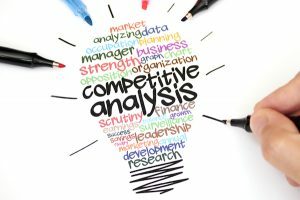 Competitor analysis is one of the first activities in a SEO campaign. Understanding what marketing activities your competitors are conducting gives you the ability to mirror and better their efforts. Search for your primary keywords in the search engines and note down which sites are performing well. This should give you a basic framework of what needs to be done to compete. Once you know who the competition is, you can begin to study where their recognition is coming from. Simple techniques such as a quick Google search can help you see where they are mentioned online and how you can begin to be recognised and go even further. As your brand grows online people will start to talk about you on blogs, forums, and social media. You need to monitor who is talking about you and what they are saying. You can build positive relationships and create brand advocates with those who praise you, and look for ways to improve your processes, products or customer service for those who talk negatively. You can use tools such as Google Alerts and Talkwalker alerts to do this effortlessly. Just enter your brand name and you will receive regular updates of whoever is talking about you online. With a gauge on how people judge your business, you can act accordingly. Do you need to fine-tune certain areas? Should you concentrate on ensuring your quality levels remain as effective as they already are? You can find answers too many questions thanks to alerts. A really powerful SEO strategy is to look for content that is currently ranking on the second page of the search results. It’s likely that it this page will only need a slight push to get into that all important first page. Usually if you refresh, update and expand the content on these pages it will give them an initial boost. This can work regardless of the page’s intention, too. Whether it’s a blog post, product page or service page, you may be able to convince search engines that it belongs higher up the SERPs with a few tweaks. Content and relevancy are two huge ranking factors and by shoring these up, page one may just come calling. A massive mistake that people make during any form of marketing is focusing on themselves. Even traditional marketing revolves around listening to your target market and providing solutions to those problems. SEO is no different. Keep a watchful eye on the industry forums, blogs and question and answer sites to see what issues and problems your target market has then try to address and solve them effectively. Sure, there’s no harm in telling people who you are and what you do but if that doesn’t match to what they want, it’s all wasted time and effort. Having an ongoing writing column for top industry publications can have an unbelievable effect on your success in a number of ways. Firstly you are building on your name as an authority and thought leader within the industry. Secondarily, you are exposing yourself to a whole new readership. Thirdly you can point those all-important links back to your site. You can use sites such as AllTop.com to find the top sites in your industry and then reach out to them offering yourself as a contributor. Don’t be put off if your newly established site is rejected by a major publication – it’s extremely rare to find anything other than a top brand writing for the big players. As you make your way up the ladder, you can begin to aim for so-called better publications. Don’t set the bar too high, too early. You’ll naturally increase your reputation as you grow, opening more doors for guest columns along the way. KUMO are a digital agency specialising in online marketing. KUMO are partners with Google, Brightpearl, and PayPal and are Bing Ads Accredited Digital Agency. Providing bespoke Web Design, Development and Online Marketing services. Please do ensure you subscribe to this blog to keep updated about our emails and activities! You can also follow us on Facebook, Twitter, LinkedIn and Instagram.